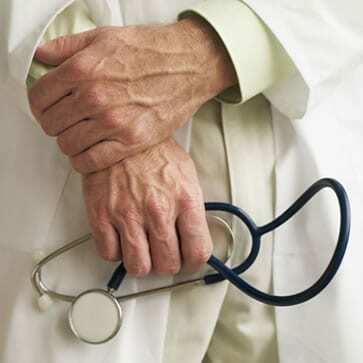 Throughout the healthcare sector, soiled linen is one of the principle vehicles for harmful bacteria. For those working in care homes and healthcare facilities, that means coming into contact with potentially dangerous items – such as bedsheets, towels and clothing – every day. Here are the most frequently asked questions about dealing with contaminated laundry, and how to limit the occupational risks involved. What does contaminated laundry mean? In the UK, contaminated laundry can refer to any item of linen which has either been fouled by human waste, or infected by somebody with a contagious illness. Interestingly, our definition of contaminated laundry is different to the rest of Europe, where they have separate processes depending on whether linen is fouled or infected. Here, regardless of whether a resident has wet the bed, or contracted a healthcare associated infection (HCAI), the linen will be considered ‘red bag’ washing. Infections are generally transmitted either through the air, through food, through insects or through contact – by which we mean things like linen. This makes linen one of the main ways bacteria and viruses are spread around in the healthcare environment. Who has occupational exposure to contaminated laundry? When it comes to who is at risk of contaminated laundry, there are two key things to think about: one is that if you work in a care environment and you are handling fouled or infected linen, you could be exposed to any bacteria that it might be contaminated with; just as important is that within a healthcare establishment, the majority of people will be elderly residents or patients who are more vulnerable to infection. How can these risks be reduced? Because humans and animals are where bacteria and viruses originate, the best way to reduce the risk of infection in a care home is to reduce the amount of contact between staff members and clean linen – the latest guidance recommends that items are handled no more than four times once washed. In order to protect both staff and residents, is vital that those working in a care environment ensure that all linen remains harmless at every stage of its journey – from the time it is collected when dirty, to how it is transported and stored once clean. Part of that is wearing the correct protective clothing, such as disposable gloves and aprons, when handling contaminated laundry in order to reduce the exposure to potentially harmful micro-organisms. How should staff deal with soiled linen? 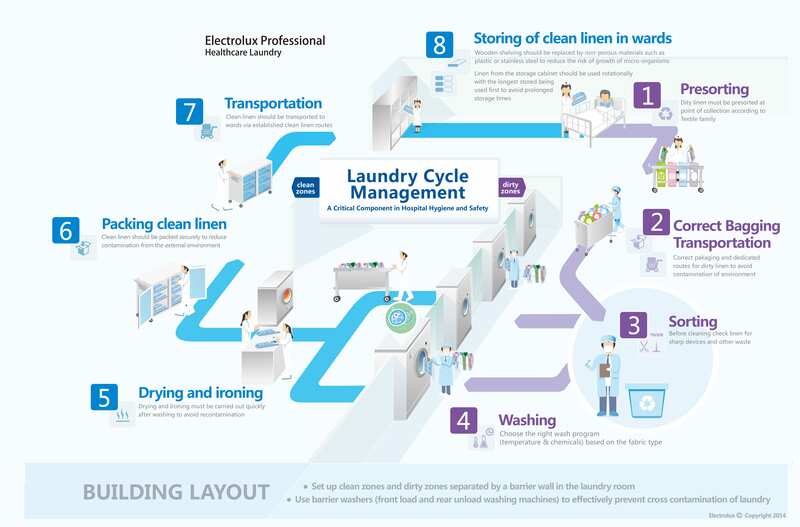 In order to help operators with managing the full laundry process, Electrolux Professional has established its own system of ensuring linen is cleaned properly, and kept clean until it is ready to be used again. The eight-step process is based around the Risk Analysis Biocontamination Control (RABC) principle, which helps to identify the dangers within any given environment, and establish the correct target levels and tolerances for each potential hazard. 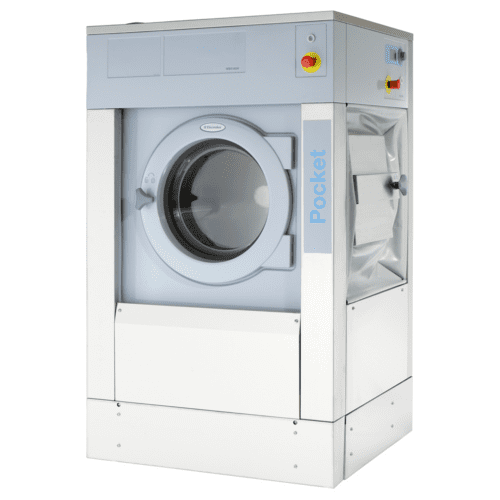 With that in mind, a laundry cycle management system gives operators detailed help with each stage of the journey, explaining how linen should be collected, transported, washed, dried, packed, transported and ultimately stored once clean. Why should care homes use colour-coded bags for laundry? The obvious benefit to using a colour-coded system is that it will allow the segregation of different types of laundry materials. Because items most at risk of causing infection can be separated from an early stage, it is much easier to ensure each one is accurately identified and dealt with accordingly – dramatically reducing the risk of infection to staff and vulnerable residents. Barrier washers provide the best defense against the spreading of microorganisms and cross infections. Total flexibility with the highest quality results. We offer the solutions for all kinds of Facility Management services. Hospitals and clinics have very strict hygiene regulations covering the handling and cleaning of linen, laundry, towels and staff clothing.